Home Ask Vance Lost Memphis: What Did H.G. Wells Have To Do With Britling Cafeterias? Lost Memphis: What Did H.G. Wells Have To Do With Britling Cafeterias? It's probably not common knowledge that the famed British author H.G. Wells played a role in one of our city's best-known restaurants. I'm referring to Britling Cafeterias, which occupied very impressive buildings downtown before branching out to other areas of Memphis. The first one here opened in 1921 at 155 Madison. A second location opened in 1938 at 75 Union, right next door to the Loew's Palace Theatre. The founder's name was not Britling, as you might expect, but A.W.B. Johnson, who decided that "Johnson's Cafeteria" just didn't have the right ring to it. The story goes that he was reading a collection of short stories by science-fiction master H.G. 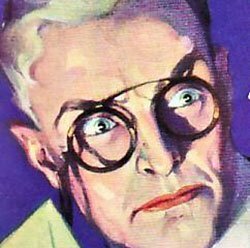 Wells (author of such classics as War of the Worlds and The Time Machine), when he encountered a story titled, "Mr. Britling Sees It Through." He decided that was a fine, classy name for his new eatery, and eventually opened others in Nashville, Louisville, Lexington, and Frankfort, Kentucky. The company's slogan, as it was promoted on menus and matchbooks, was "Good Food Is Good Health." Still, eating there could, at times, be rather risky. Customers of the Madison Avenue Britling had a narrow escape on the afternoon of November 4, 1929, when rags stored in the basement somehow caught fire. Within minutes, the whole restaurant was ablaze. Firemen rushing to the scene discovered a tragedy in the making, as more than 300 people jammed the exits trying to escape. But then an odd thing happened, as reported in the Memphis Press-Scimitar: "A phonograph that changes records automatically kept playing as the patrons filed out of the burning building. Officials believe this helped prevent a panic." Except for a few cases of smoke inhalation, nobody was seriously injured. After the fire, the owners rebuilt the cafeteria, and this photograph (above) from the mid-1950s shows a stunning building with a truly fantastic ground-floor facade — all sweeping curves and polished marble and gleaming stainless steel. But that location closed in 1956, and the fine structure was demolished just a few years later to make way for First Tennessee Bank's headquarters. The building at 75 Union, which featured a Colonial Revival facade complete with portico and white columns, was greatly remodeled during this period. Among the enhancements: murals by noted Memphis artist Burton Callicott, and "one wall will be a precast terrazzo panel in three dimensions in an off-white shade," which the designers bragged was "the first of its kind in Memphis." I guess we'll have to take their word for it. Britling built another cafeteria in Poplar Plaza in the late 1950s, and by 1970 also had branches in Laurelwood and Northgate shopping centers. But then things just went downhill. The Union Avenue Britling came tumbling down — along with the Loew's Palace — to make way for Parking Can Be Fun. The Poplar Plaza Britling closed and went through several incarnations, I believe, before becoming home to a French Riviera Spa. I can't tell you what happened to the Northgate location, except to say that it's closed. There are other cafeterias in Memphis, but not a single Britling. And the next time I venture to Nashville, Louisville, Lexington, or Frankfort, I'll let you know if any of those Britlings survived.